Multibook - lights up, charges and wakes up!!! A reinterpretation of the traditional book in a multitask product. The decoration inspiration was found in the miniature Middle Age "lightened books". A lamp? An alarm clock? Yes, the Multibook!!! An inseparable companion whther on a shelf or on your bedside table. The pages diffuse the light of 74 LEDs. Inside the book you can find the oulets and space for keeping the cables. 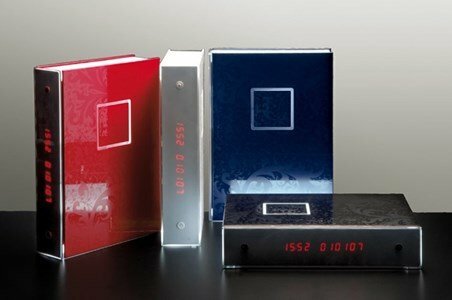 The digital numbers of the alarm clock and date appear on the side of the book. Multibook can be personalized with a photo or a dedication. Made of injection moulded coloured polycarbonate structure with injection moulded. Opal ABS diffuser. 74 LED diffused light lamp. On/off switch on the back.